The Holy Trinity Church in Fareham is arranging a sale of some of Nigel's possessions to help buy a defibrillator in his memory. It will take place on Saturday October 28th, between 10am and 2pm in the church hall in West Street Fareham. More details here. In memory of Nigel, the Villagers have instituted the Nigel Dean Award to be presented annually to the person whom the group felt "went the extra mile" in their contribution to the year's production - something that Nigel always did. For the initial award, the group overwhelmingly felt that it should be presented jointly, to Nigel's fellow founders of The Villagers - Ian Wright, Glyn Wright, Aussie Hicks and Carol Hicks. Nigel was a member of The Villagers from the outset. For 30 years, he remained central to everything we did. We will remember him in so many ways. He was a fine actor, bringing real depth, understanding and commitment to each role. Among his many triumphs, we loved his Bottom in A Midsummer Night’s Dream, Sir Toby Belch in Twelfth Night, Shylock in The Merchant of Venice and Caliban in The Tempest. The rich variety of characters he played demonstrate the skills he had in abundance. He was a director of plays. He directed with great warmth and was a constantly encouraging and supportive leader. He knew how to get the best out of the play and out of the actors tasked with bringing it to life. 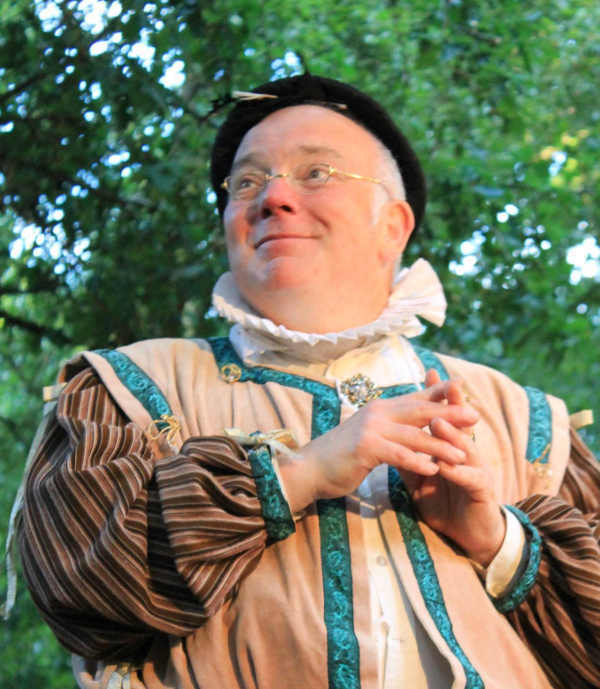 He particularly enjoyed working with young actors, many of whom were acting in Shakespeare for the first time and there are a lot of Villagers, past and present, who are eternally grateful to Nigel for his knowledgeable support. He was a backstage hand par excellence. Many members of our audience will have seen Nigel around the set; putting up lights, telling them to switch off their mobile phones, sorting chairs, selling tickets, providing protection from the rain! and any other job that needed doing. And who could forget the pink shorts and rugby socks that showed off his little legs?!! It was typical of Nigel that he was always there at all stages of a production, willing to muck in and do anything necessary. Above all, Nigel was a friend to us all. The Villagers proudly proclaim that we are “a group of friends who every year, accidentally put on a play”. The play may not be accidental but the importance of friendship and camaraderie in the group remains paramount. It is as a friend that we will miss Nigel more than anything else. He was a true friend in every sense of the word. He had a great sense of humour, an infectious enthusiasm for living life, genuine concern for the welfare of his fellow actors and was a truly “nice” man. He might have been small, but he was a mountain of hope, support, and warmth.